Yoko and Hajime (centre) on one of several train journeys. I had somehow gained the impression that this was not going to be the best of director Hou Hsiao-hsien’s recent work, but enjoyed it a great deal. Certainly, if I hadn’t seen Millennium Mambo (2001) and Le voyage du ballon rouge (2007) I would have found it more difficult. As it was, I was prepared to go along with its gentle narrative flow and just observe a new, but still East Asian, perspective on the life of Tokyo’s suburbs, coffee shops and railway systems. The railways are the giveaway clue and this is a film commissioned by the Japanese studio Shochiku to commemorate the centenary of their famous director Ozu Yasujiro in 2003. I take the title to be a play on words evoking film history and the coffee shop (what would have been a bar in Ozu’s Tokyo) which forms the alternative setting to the railway. The central character in the narrative is Yoko, a young writer from Tokyo who is researching a Taiwanese musician/artist from the 1930s (Jiang Wen-Ye (1910 – 1983). She has just arrived back from Taiwan and she spends time with her parents who still live in Takasaki, a city in Central Japan 100km away by rail. Later she meets up with her friend Hajime, a bookseller in Tokyo with a railways obsession. There is very little plot but part way through the narrative Yoko reveals that she is pregnant. I’ve read a lot of comments about the film and what many of them miss is that although Hou’s film is undoubtedly an art film, Ozu produced mainstream entertainment, albeit for what I assume to be an upmarket audience. This is an important point because although loving Ozu marks anyone out as a cinephile today, in the 1950s and 1960s he would be a ‘popular’ director. Hou, however, is definitely for cinephiles. However, Hou knows how to sell a film. In his earlier career when he was a leader of Taiwanese New Cinema, he invariably cast non-professionals. Here he casts Yo Hitoto, a Japanese pop singer in her first acting role, as Yoko. Hajime is played (in very relaxed style) by one of Japanese cinema’s leading stars, Asano Tadanobu. This is the ‘real’ railway shot that Mark Lee frames (more poetically) but even in this Creative Commons photo from Wikipedia it looks magical. Café Lumière is a very easy film to watch, but arguably a difficult film to read. Mark Lee’s camera frames characters in careful, often static, compositions in Hou’s usual recent style – i.e. through doorways or windows, down corridors, round corners etc. Outside the houses and coffee shops it offers us long takes in long shot, observing the world and Yoko’s journey through it. The shots of trains and trams are beautiful. 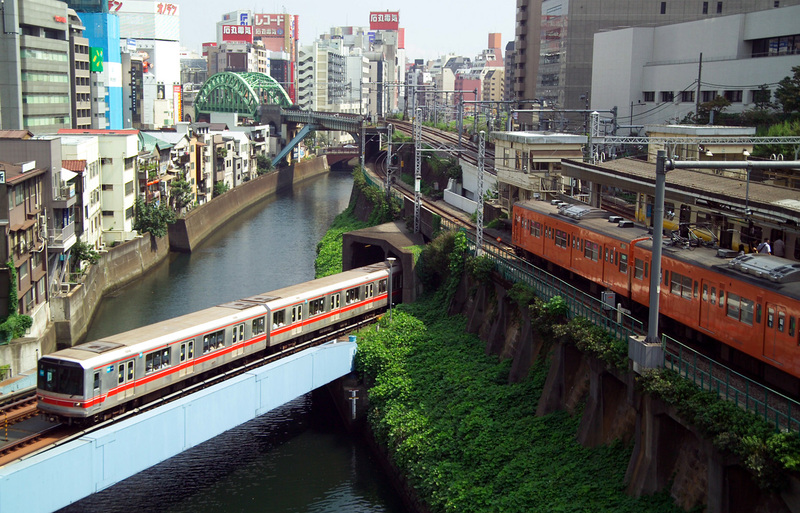 One shot of a minute or so shows a scene in Tokyo with three railway lines at different levels crossing over each other – and across a river. It’s as if we are looking into a model railway layout or watching a scene from an anime. I love trains but I can understand that for many they are not particularly interesting. And this is what makes the film problematic for a mainstream audience. Comments on the film complain about particular scenes, why are they doing this or that? There is a desire for narrative, a need to be told something, for actions to be in a chain of cause and effect – for the story to mean something in the way that David Bordwell and Kristin Thompson argue constitutes a typical Hollywood narrative. But this story doesn’t have an ending, it doesn’t really have a direction. What we see instead is a family and a relationship between friends. In many ways this is a ‘realist’ film par excellence since it corresponds to the ways many of us live our lives – we don’t lurch from one dramatic crisis to the next, sometimes what we aim to do isn’t achieved, we can’t think of things to say, we’d rather just stare out of the window. Café Lumière could be described as a postmodern narrative, one in which references are made to other ‘texts’ on several levels. The situation of the unmarried daughter and her parents’ concern features in both Ozu’s Late Spring (1949) and Early Summer (1951) and one scene is very close to that in Tokyo Story (1953) when the parents visit their widowed daughter-in-law who has to borrow something from a neighbour in order to offer them hospitality. Hou doesn’t attempt to copy Ozu’s compositions directly but he achieves something of the same tone. The obsession with Tokyo’s railways emerges not just through Hajime’s actions as a character but also the camera’s seeming obsession in almost fetishising train images as if exaggerating Ozu’s occasional glimpses of trains simply for effect. Yet railways also act as triggers for memory – Yoko spots the station cat which she remembers from her childhood in Takasaki when she took the child to school. It’s also interesting that she lives on a tram route in Tokyo, one of the last two remaining from Ozu’s Tokyo. None of these references will mean much to audiences unaware of either Ozu or Taiwanese-Japanese history but this is the nature of film art for a cinephile audience. The little details that emerge about the Taiwanese boyfriend and from Yoko’s meeting with Jiang Ewn-Ye’s widow and daughter point to a ‘discourse’ about a personal and cultural history that brings together China, Taiwan and Japan over the last century and which is mirrored in the histories of the film industries in these countries (and which also involves Hong Kong). Hou is now in his 60s but still wishes to represent a younger generation – even when it is via the incomprehension of their parents. Fortunately, for me, the occasional musical accompaniment, which I think refers to the composer who Yoko is researching, was much easier on the ear than the techno of Millennium Mambo. This entry was posted in Japanese Cinema and tagged Hou Hsiao-hsien, Mark Lee, Ozu, railways in film. Bookmark the permalink.